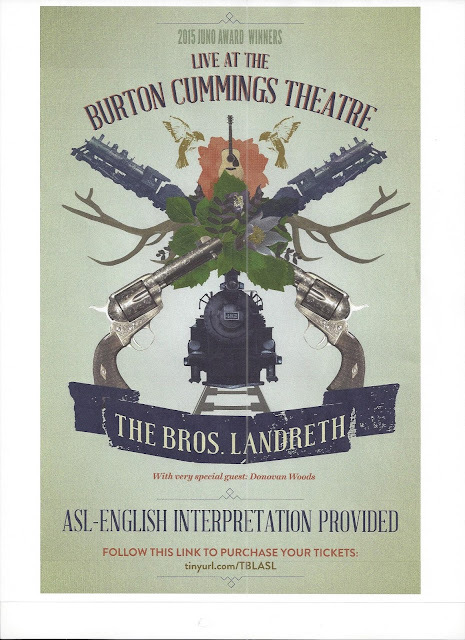 I'm very excited to announce that The Brothers Landreth will be having ASL-English Interpreters at their upcoming show October 17th, 2015 at the Burton Cummings Theatre! If you are interested and would like to attend, please follow this link ( ) to purchase a ticket in an interpreter friendly section! While you are purchasing your ticket, please ensure the tickets are in the first 4 rows of section C. For those who are unable to purchase a ticket online, please contact Anna via email at annasalgadoe@gmail.com to make arrangements to pay in cash. Please note that there are a limited number of seats reserved for people who would benefit from an interpreter, so let's make sure those folks get those seats. Feel free to share this post to get the word out! Thanks everyone!